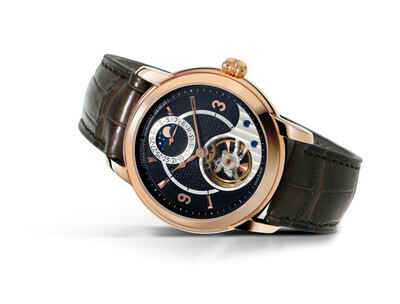 This year Frederique Constant celebrated the ten-year anniversary of its calibre the “Heart Beat Manufacture”. To date, the brand has developed 15 calibres, which have all been crafted by hand. Constantly dubbed the Heart Beat Manufacture, the movements feature an aperture at six o’clock in which wearers can view the balance wheel bridge – this is actually patented signature. In order to distinguish a luxury model from an entry-level model with third-party movements, all Frederique Constant watches that are made in-house have the word “Manufacture” in their name. Recent models have even started to incorporate newer technology, such as silicon escapements that don’t require any lubrication. This not only results in a longer lasting device, but leads to increased efficiency. As a celebration of their short, but inspirational history, Frederique Constant have released two special Jubilee models. The Heart Beat Manufacture Silicium Jubilee Edition features the latest calibre developed by the company — Heart Beat Manufacture FC-942 Silicium. In addition, it contains a moon phase complication indicator at twelve o’clock and aperture at six o’clock. The collection is highly exclusive and limited to 188 models in 18K rose gold and a mere 18 models in platinum. The 42 mm case houses the manufacture automatic movement FC-942, beating at 28,800 vibrations per hours and offering 42 hours of power reserve. Even more exclusive than the Heart Beat Manufacture Silicium Jubilee Edition is the Slimline Tourbillon Manufacture Jubilee Edition. 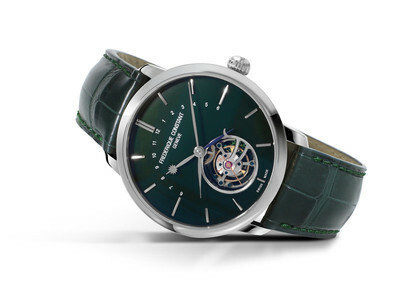 The 2014 model features a dark green dial; automatic one-minute tourbillon movement; silicon escapement wheel and anchor; and day and night indicator. Limited to only ten pieces in rose gold and ten pieces in stainless steel. 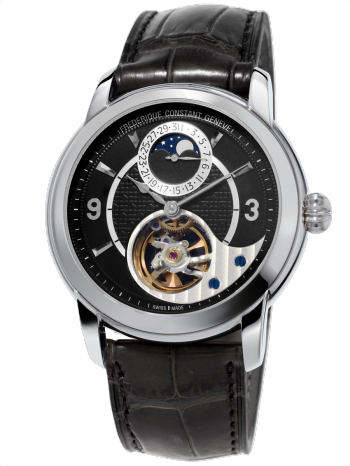 Frederique Constant is an independent family owned business that was established in its current form in 1988. 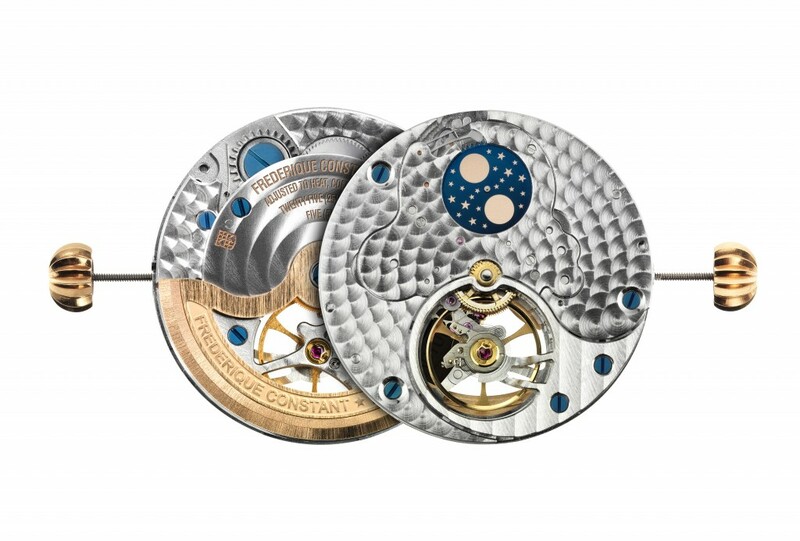 Aletta Bax and Peter Stas launched the first models in 1992, which were assembled by a watchmaker from Geneva and featured complete Swiss movements. Unlike many other luxury watch brands, Frederique Constant is involved with the watch production process from the very beginning up until they are sold. Cutting-edge computer software is used to design the timepieces and aid the development process. Like many other luxury watch brands, Frederique Constant are based in Genève. The company embraces cross-fertilization between other brands and co-operation with other independent manufacturers; in fact, many of Frederique Constant’s watchmakers have gained experience with some of the world’s most prestigious brands before joining the team. The Frederique Constant name is always something of intrigue. It was formed from two separate names; Frederique Schreiner 1881-1969 and Constant Stas 1880-1997 who founded a clock dial company in 1904. Current company president Peter Stras is a 4th generation descendant of Constant Stas. I am a huge fan of Frederique Constant and indeed own one of their watches (check out my review of the excellent world timer). When it comes to value for money this brand is right at the top of the pile. Excellent quality cases and dials with an in-house movement to boot and all within reach of the average collector or connoisseur. If you don’t already own one of their watches then I recommend you go out and buy one. You won’t be disappointed. I will be adding one of the above to my collection very soon!